Walter Davis, Jr., piano; Sam Jones, bass; Art Taylor, drums. Joe Goldberg, in his notes for Off To The Races, Donald Byrd's last Blue Note album, spoke of Donald's coming of jazz age despite the obstacles created by excessive, extravagant praise being poured on him prematurely. Here in Byrd In Hand, Donald affirms his maturity. If you listen to the surety with which Donald Byrd plays here, you will have a perfect example of that maturity. In fact, all the players here speak out boldly and vigorously, but not blatantly, in an assertive, masculine, muscular kind of jazz. Some have tagged it "hard bop," hard driving in the same sense a topflight professional football fullback is when he moves in high gear. As a refutation of the implications cast by the "hard bop" tag, there is the lyricism-with-guts of performances like "Witchcraft" and Byrd's "Here Am I." Pepper Adams' deep-throated sound leaves no room for imagination as to what instrument he is playing. His baritone sax pays no debt to either Chaloff or Mulligan, the two main names in the modern development of the instrument. Pepper is very much his own man; his bittersweet, sometimes tart, always swinging lines are provoking to be influential in themselves. He and Byrd have worked together quite a lot in 1958-59; in elongating and deepening a musical friendship that began in Detroit, they have strengthened their work together. Charlie Rouse, influenced by Coleman Hawkins, Charlie Parker and Sonny Rollins, but author of a somewhat unorthodox, personal representation of his thoughts, makes it a full, rich-sounding three in the front line. Pianist Walter Davis Jr., first active on the New York scene when Max Roach brought him over from Newark, New Jersey with Hank Mobley to play with Roach's quartet at the Down Beat club in the early '50s, has just now really begun to achieve some recognition. In the interim, he played with Dizzy Gillespie but it wasn't until his appearance with Jackie McLean in New Soil, that his talents as a player and composer were fully exposed. Here he displays a warmth in the Bud Powell idiom and two melodically and harmonically attractive compositions in "Bronze Dance" and "Clarion Calls." Two of Rouse's groupmates in the Thelonious Monk Quartet during 1958-59, were Sam Jones and Arthur Taylor. Their experience as a team is evident and indispensably helpful throughout. Leader Byrd, with all these excellent supporters and imaginative, well executed scores, shines in his finest, most polished effort to date. His compositions have substance: "Here Am I" a plantively beautiful piece; "Devil Whip" crackling with an undertone of impending evil; "The Injuns" a fleet scouting expedition which lets everyone ride out on the plains. His playing has that hot sweetness and pungence which characterized the best of the late Clifford Brown. Donald has attained real stature with this album. 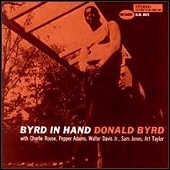 A Byrd in hand is worth two on the record store shelf.